Today, NYTimes.com has published a story Expatriate Bloggers Chronicle Details of Home Renovations, in which it mentions our house renovation project. It’s great to see that there are many other fellow expat bloggers around the world doing something similar to what we’ve been up to — taking the challenge of renovating houses in foreign countries. Thanks to journalist Roxana Popescu for reaching out and documenting our fun adventures in her story. The article is also in print in today’s issue of International Herald Tribune. The short answer is … in Germany. Just a 1.5 hour drive away from Brussels, there’s Aachen with a myriad of shops for any kind of renovation or construction project you can think of. And, importantly, in many cases, prices are about the third of what you will pay for paints in Belgium’s Brico, Gamma and the like. It of course greatly helps if you can speak German, but even if you don’t, an adventurous spirit, a little bit of “homework” putting the required addresses into your GPS, and you are good to go. If you want to get paint for your walls, ceilings and woodwork, our recommended destinations are Bauhaus and Obi. These are big chains of do-it-yourself stores, similar to Brico, but with a larger selection of items — at better prices. There are plenty of Bauhauses and Obis near Aachen. In terms of price/quality ratio, our preferred choice was Bauhaus’s own label of paints. We just selected the shades we wanted from their wide choice of colors, and they mixed it right away. Obi’s own label had good color tones, but we found the quality to be not as good as Bauhaus’s. Luckily, we got Obi’s paint only for one room. On February 22 we wrote a post to announce our search for people with passion for and know-how in interior design. Our main motivation was to get to know some creative and funky people, write about them on this blog, and listen to their ideas and tips regarding the final stage of our home renovation project — interior design. 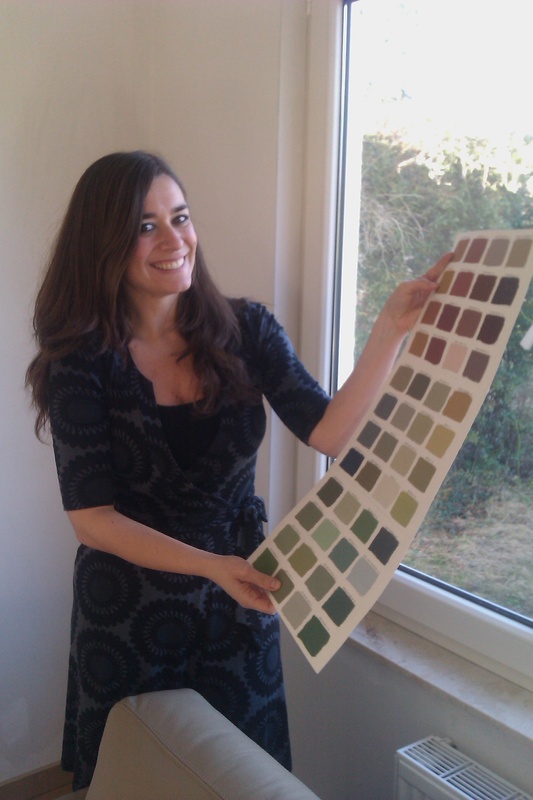 One of the people who has responded to our call for interior designers was Sofia. She found us with the help of The Network, a Brussels-based email list for expats living in Belgium where we also had posted our call for interior designers. 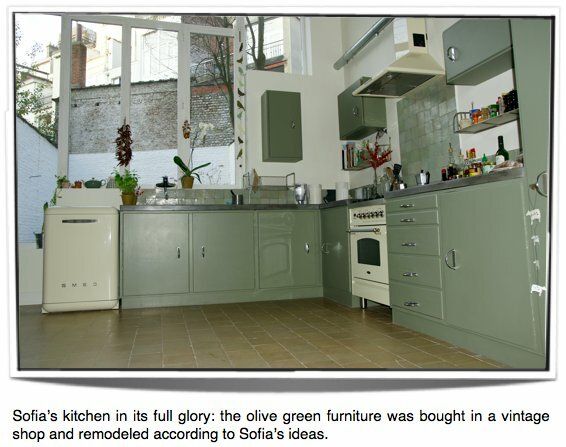 Whereas Sofia didn’t tick the box of a “student” (we were initially looking for interior design students), she surely caught our attention by her hobby — all things interior design. What we liked most was the immediate and chemistry between us. Sofia’s warmth and friendliness, as well as her hospitality (she opened the doors of her beautiful house to us shortly after our initial contact) were striking. 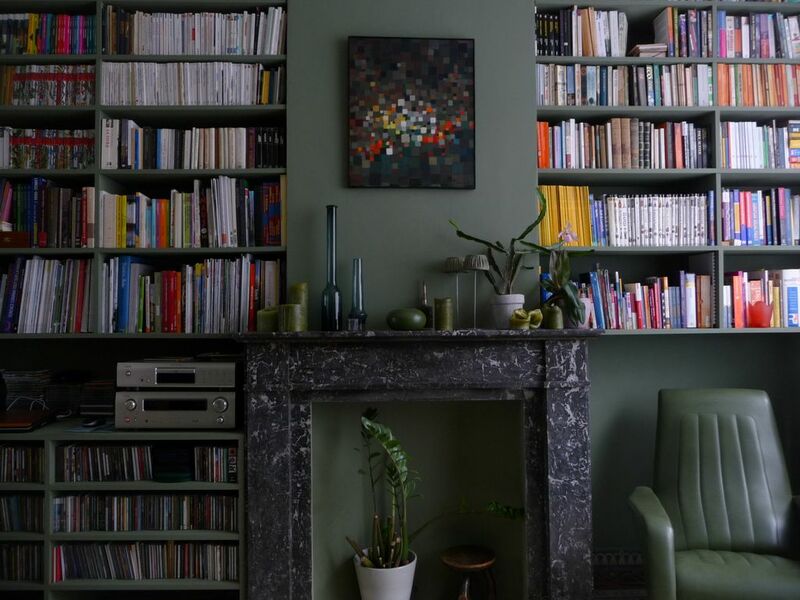 As she was showing us her stylish house in Ixelles, which had been renovated based on her own concept and choice of materials and color palette, her knowledge of interior design and decoration was immediate. A look at Sofia’s house made us convinced that rich colors in interiors are so much more fun than dull neutral palettes that I encounter in most homes. Sofia works for an international organization based in Brussels. Outside work, her interest in home decoration occupies most of Sofia’s free time. “Among my friends, I am known as someone who’s full of ideas about home renovation and decoration. I am often busy giving tips and ideas to people about their home decor, and I am seriously considering pursuing this passion further. I don’t know yet where it will lead me exactly, but I am full of exciting ideas,” Sofia shared with us. According to Sofia, a home reflects the personality of people who live there. It should therefore be unique. Use your imagination: How would you like the space (be it kitchen, living room, bathroom, bedroom) to look like in the future? Close your eyes and imagine it. Don’t be afraid, anything can be transformed. Windows can be made bigger, walls can be removed, floors can change, extra space can be created with some imagination, old couches can be re-upholstered with new fabric. Get inspiration: start with a piece you love! A carpet you have brought back from a trip, your grandmother’s rocking chair, a piece of furniture you found on the flea market which can be repainted, a vase with a lovely colour, a batik cushion which you always had with you: these are items you absolutely want to have in your rooms. They can become your key pieces around which you can start imagining the rest of the space. What are your favourite colours? Make a list, collect colour and fabric samples. Do they match each other? Read some decoration magazines and cut and keep examples of colour combinations or original materials or ideas that you like. Dare to use rich colors whilst respecting the harmony of the house: for example, make sure that colors in one room do not clash with the colours of the corridor leading to the other room. If you are renovating, keep as many of your house’s past-era charms as possible: decorative cement tiles, marble chimneys, well-functioning iron radiators, ceiling moldings, door knobs. These elements will add to the uniqueness of your house. 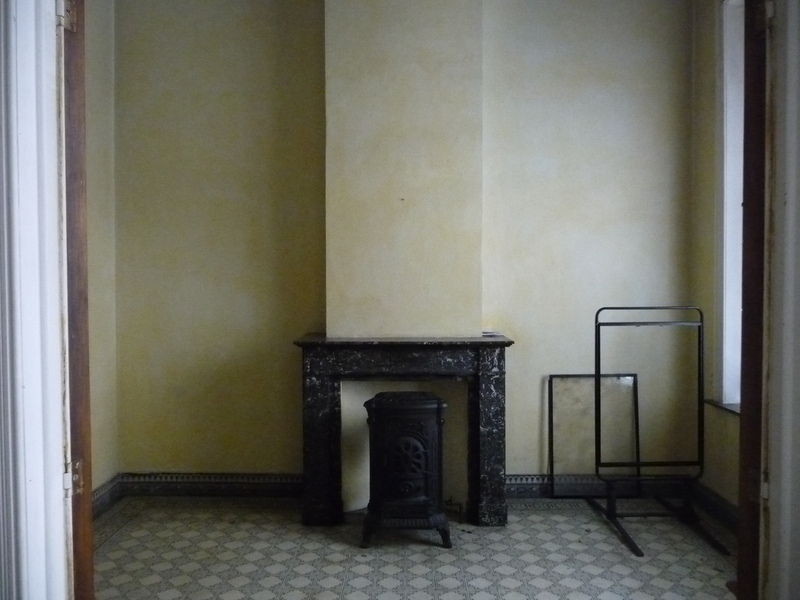 Respect the style of your house when thinking about the furniture: Would a 60s or 70s building look good with only Louis XV or IKEA furniture in it? I don’t think that a rustic fireplace surrounded by ultra-modern huge sofas will look very good! At the same time, you can combine different styles if the colors match: a retro lamp, a unique coffee table, a funny carpet, different chairs around a table, many vases of different colours but of the same era (or of different eras but of similar shades) — all of this can look very original! Give a 3D dimension to the space by hanging shelves, colourful paper garlands, little sparkling lights and bookshelves. Trial and error: Do not look at the bare walls and panic. If you want to avoid white, and if you like a particular color a lot but hesitate to use it on your walls, just remember that errors can be corrected. 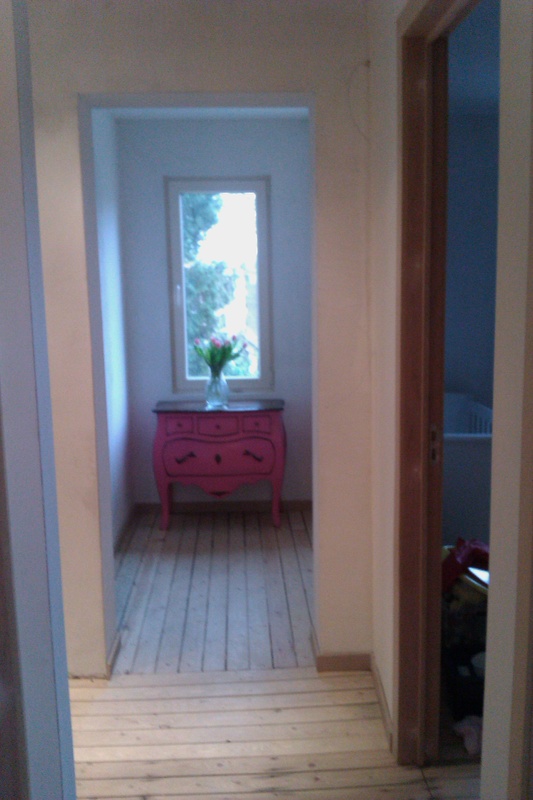 In the space of a weekend, you can change the color of your walls thee times. On Friday evening, when you come home from work, apply the 1st layer of the color you like (provider that the walls are already prepared in advance). On Saturday morning, apply the second layer of paint. If the result is not how you imagined it, on Saturday afternoon you may paint the 1st layer of primer, and Sunday morning, apply the second layer of primer. Sunday early afternoon, it’s time to apply the first layer of that other color you’ve kept as a reserve. And after applying the second layer of paint on a Sunday evening, you’ve tried the different options and, hopefully, have the result you like. Painting walls is fun! And it is a good exercise for the body as well! Here is my golden rule while renovating or decorating: measure, measure and measure! Always carry a measuring tape with you and a draft plan of the room you will be decorating. This will save you from buying a couch too big for the destined space, bookcases too high to fit, table too low for the chairs you already have, or a bed frame which does not fit in the bedroom. We will be soon posting some more tips from Sofia, as well as updates of our own progress with interior decoration, so watch this space. And for now, many thanks to Sofia for being so resourceful and fun! I’ve already written about choosing colors for interior design. Since then, I’ve let my creativity flow, bought several home decoration magazines, and started thinking out of the box. Here is an important tip that I want to share with you today. If you have a large painting project like ourselves, and don’t know where to start choosing colors, work around some of your favorite furniture or art pieces that can set the scene. It was an entirely impulse purchase, but both Sean and I liked it immediately, and thought it would fit into an unused niche in one of the corridors. Since the color of the commode is so particular, it sets the tone to the whole of the surrounding area. Not that I will start painting all my walls pink, but at least I only have a limited range of options now, so my choice is easier. I find these tiles very beautiful, and they immediately give a limited, and easier, range of options for choosing color for the area that surrounds them. Another example is this beautiful chair called MoonLounger by Belgian designer Gerd Couckhuyt. I don’t own one of these, but this kind of chair would be a perfect fit for my office where I definitely want to use orange as the main color, possibly mixed with a tone of aubergine, as illustrated on the photo below. The latter can come in handy if you want to restore the old tiles in your house — this shop has a large collection of second hand tiles that might match yours! We’ve had all the walls replastered. We’ve changed the heating, electricity, and replaced all windows. We’ve put lots of insulation everywhere. Generally speaking, we’ve pretty much made a totally new house whilst preserving the look and feel of our 20’s villa. But funnily enough, having completed this massive amount of work rather successfully, I am now stumbling on something that SHOULD be easy. I just can’t choose the colors for the walls! 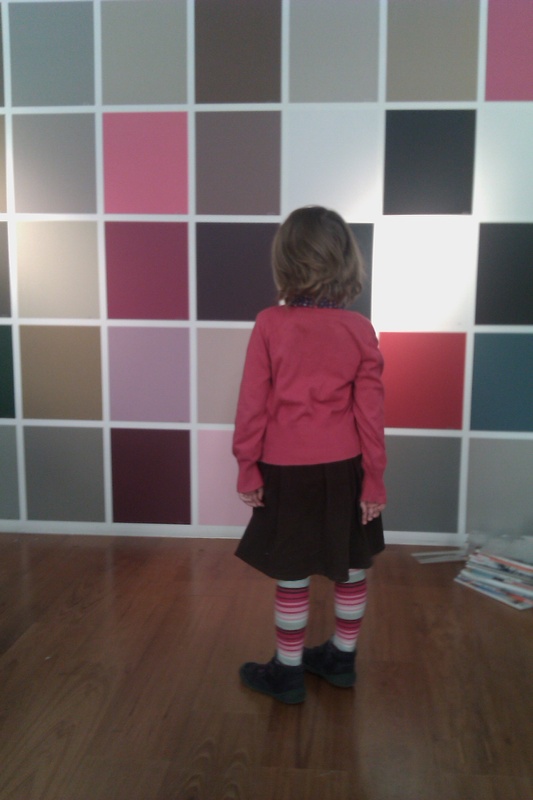 Our daughter is selecting the wall paint for her room. "It should be pink or yellow, or both!" Or rather, I guess I like too many different colors. I spend time imagining different color palettes in my house, because I know that color is super important in getting that right look and feel. As much as it is important in influencing your mood. I’ve written about the role of color in graphic design, and branding in general, on my professional blog. To give you a simple summary, the choice of color for your logo, for instance, plays an important role in creating a certain perception about your product, or company in general. 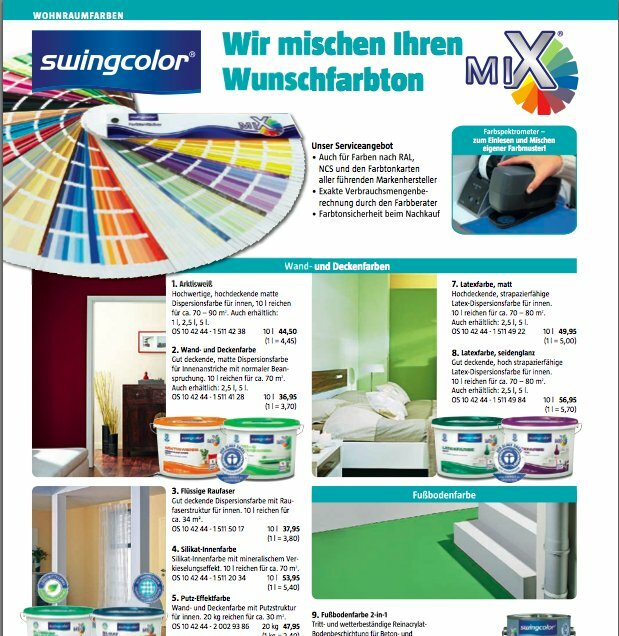 So, how to begin choosing the colors for your house? To get some help on this, we’ve posted a call for young interior designers who could advise us on this important matter. We’ve received some feedback already, and will be meeting with some people passionate about interior design pretty soon! And meanwhile, if you know any rules and tips about how to give a go at that color palette for your house, share them with us! 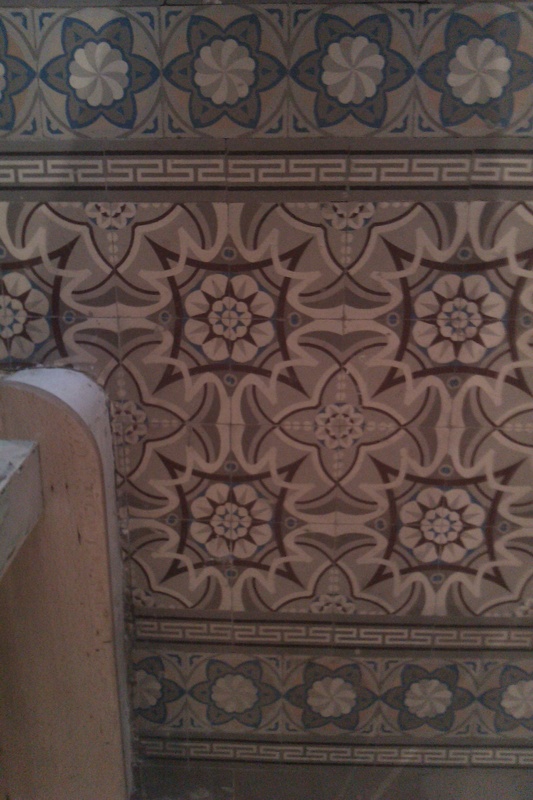 As mentioned in an earlier post, cement tiles are a typical feature of many Brussels town houses, and we have some too. These tiles are often in a bad state though, because they crack easily, and in our case we have a few gaps after the renovation that we need to fill, due to moving some floors. 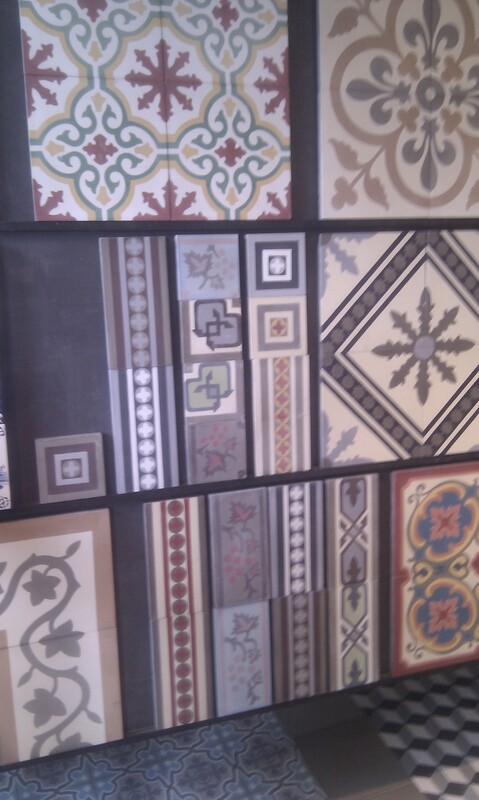 So we were happy to notice this shop had opened in Brussels, which has a tremendous selection of these tiles, really allowing you to recreate an authentic atmosphere: http://www.carrelagesdumarais.com/ (they’re also in Paris, Lille and Nantes). We will see if we can find a few tiles to mend our floor in a way that works, but if we should need later to replace it, it’s good to know we can do so in the original style! Here are a few photos from that store of things that took our fancy. They also go glazed tiles and old-style washbasins in terrazzo.